On a trip to Africa in 1990, Peter Scott was moved to tears by the deforestation he encountered. 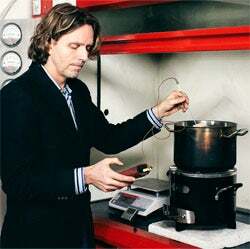 Determined to do something, he spent 15 years as a consultant for governments and NGOs in the developing world, designing fuel-efficient cooking technologies that didn't rely on wood. Through his work he taught people in 20 countries to build and sell more than 400,000 clean stoves, bread ovens and food dryers. Rising to the top: Peter Scott conducts a water-boiling test on Burn Design Lab's newest charcoal stove. Still, Scott knew he could do more. In 2010 he formed Vashon Island, Wash.-based Burn Design Lab, a nonprofit organization that creates sustainable stoves for developing countries to build and distribute. The following year he founded Burn Manufacturing, the for-profit arm that licenses the Lab's designs to build and sell stoves in Africa. Scott scored a $1 million loan from a Fortune 10 corporation for Burn Manufacturing; now he's working on securing a $3 million loan from the U.S. government's Overseas Private Investment Corporation and trying to raise an additional $2 million in equity funding. Scaling his vision so he could reach more people and save more forests--and convincing others to fund that vision--required Scott to do a lot of pitching and educating. "People have misconceptions of Africa about it being a poor place to invest," he says, noting high historic rates of return on investments in the continent. According to the U.S. State Department, Africa is home to at least six of the world's 10 fastest-growing economies. "There's this whole new thing happening where people want to do social good, and they're recognizing the limitations of just straight charity," Scott says. Wanting to change the world is not a business plan. It may seem counterintuitive to think about how you'll make money as a social entrepreneur, but if you want to have a lasting and far-reaching impact, it's essential. "An impact business can't stand on one leg," says FAFN president Steve Schueth. "It's got to have a good business model. It's got to have a good operating team. It's got to be financially sound." The fact that your business helps feed children or repurposes plastic water bottles may initially entice a philanthropic investor, "but the impact itself is not going to sell the business," Schueth cautions. There are plenty of resources available for impact entrepreneurs. Here are a few ways to get guidance. • Incubators and accelerators such as Impact Engine, Fledge, Mac6, the Unreasonable Institute and the Hult Prize help socially conscious startups refine their business models and prepare to pitch investors. • Pitch competitions such as Social Innovation Fast Pitch and #SocEnt Weekend offer a chance to fine-tune your pitch and win cash and in-kind prizes. • Impact investing groups such as the Investors' Circle, Toniic, City Light Capital and Gray Ghost Ventures specialize in funding social-impact businesses. • Networking and membership groups such as the Global Impact Investing Network and Social Capital Markets--and the events they host--can keep you informed of impact-investing trends. • Co-working spaces such as Hub Bay Area and Hub Seattle offer the chance to work alongside like-minded socially conscious 'treps. Sharon Schneider, CEO of Moxie Jean, a website that resells children's clothing, had to iron out a few wrinkles before her collaborative-consumption idea caught on. In 2011 she started as a "Netflix for baby clothes." The business owned all the clothes, and customers paid a monthly fee to "rent" them for as long as they wanted. Parents, frustrated with how quickly their kids outgrew clothing, told Schneider they loved the idea. She won a $20,000 pitch competition, was accepted into the prestigious Chicago accelerator Excelerate Labs and received $25,000 in seed money. But despite trying tactics such as Google ads with all sorts of keywords, she found few subscribers. Market research revealed that customers saw her subscription model as too much of a commitment, putting pressure on them to keep baby clothes they didn't own in good shape. "People were saying, 'Why don't you sell them new clothing every month?' But that's not the business I'm interested in," says Schneider, who is passionate about reducing wasteful consumption. "The social impact is built into my model. I couldn't stop reusing clothes and have the same business. I fully intend to make a lot of money, but I intend to do it in a way that I feel good about." Last July Schneider relaunched Moxie Jean on her terms--as an online resaler of kids' clothes, no subscription required. Parents buy clothing off the site, or they can send in gently used items in exchange for cash or credit. Now, she says, "business is going like gangbusters," with sales increasing at a rate of 50 percent a month. As with any for-profit venture, partnering with the right people is essential. Because your business has the added element of a social mission, the team becomes even more critical. When seeking investors, it's not enough to go where the money is. "You need to go with the right intentions behind the money," says Taryn Goodman, director of impact investing at San Francisco-based RSF Social Finance, which funds nonprofit and for-profit social enterprises. In other words, you need to find investors who share your goals and mission for the company. Consider Burn Manufacturing's quest for equity investors. Scott is specific: "We're trying to find an ideal partner who gets our mission and is not looking for an exit strategy in three years and is happy with an 8 percent return on their money." But finding like-minded investors can be tricky, says Michael "Luni" Libes, founder and managing director of Fledge, a Seattle incubator for socially conscious businesses. "They don't wear name tags," he says. "Or sometimes they wear name tags, but it doesn't say what their style is." That's why you need to sit down with prospective investors and see what makes them tick. If they're more concerned with finding the next Facebook, they might not be right for you. Rahier Rahman went further. Founder of Pangea, a Chicago-based provider of prepaid financial services to underserved populations worldwide, Rahman spent two years researching key venture-funding and business-development players in his niche. That way, he says, he didn't have to "spend two weeks in Silicon Valley pitching people who don't care about the space." Nor did he have to educate potential investors about the group he wants to help: the 2.5 billion people worldwide who don't have bank accounts, credit cards or other financial services. "They already know all that," Rahman says. "They have already made significant money in the 'underbanked' space. So I'm really able to build consensus around our platform." Selecting which partners and investors to woo is only half the battle. Knowing how to pitch them is equally important. "The biggest thing I tell social entrepreneurs is actually not to define themselves as a social entrepreneur," says RSF Social Finance's Goodman. Many people, she explains, mistakenly believe that there's no way a social-impact business can make money, or that it's a "nonprofit in disguise." It can be far more effective to focus the pitch on the social or environmental outcome of the business, rather than on your own philanthropic ambitions. FAFN's Schueth agrees. When pitching, he advises, first sell investors on your business model, operating team and ability to go to market. Then you can say, "This business is designed to have a very positive impact, and here's how we're going to measure it." The more specific your metrics are, the better your shot at getting funded, he adds. Scott is banking on data to get his mission across. 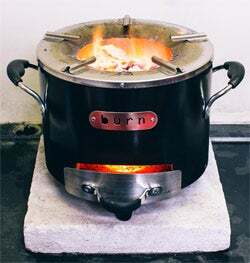 Among the metrics he has shared with potential partners and investors: One of his $30 Burn stoves reduces energy use by 50 percent, saves households $250 a year in fuel costs and reduces indoor air pollution--a contributor to the deaths of nearly 2 million people a year. "All those metrics are really important," Scott says. "When we're talking to impact investors and equity investors, they're really looking at both of those things: Is it sustainable? Is it profitable? And is it having an impact?" Burn's metrics speak volumes. In presentations, once Scott starts rattling off numbers to his audience, "90 percent of them get it in five minutes, and 10 to 20 percent are mobilized to do something about it," he says. Of course, there are other numbers that mean much more to him. "Even if we only met 10 percent of our metrics," he says, "we'd still be saving 12 million trees."